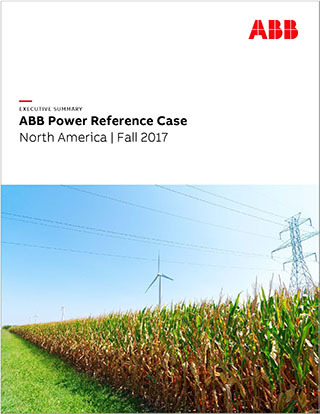 Complete the form to request the first chapter of the ABB Power Reference Case Report. A comprehensive plan for any new power project is core to its development and capital investments. That’s why having access to unbiased, actionable market insights and investment-grade forecasts is critical to mitigate risk and have full confidence in your decisions. ABB EPM Advisors Reference Case forecast includes power, natural gas, coal, emissions, renewable energy credit, and capacity prices. Value power purchase agreements and generation assets against 25-year Market Clearing Price and capacity at 73 pricing hubs on an hourly, monthly and annual basis. Make timely investment decisions based on latest fuel forward curves and recent market developments with our monthly updates to our forecasted energy price curves. Assess your portfolio and strategically modify your capacity plan based on forecasted additions and retirements of traditional resources, transmission limits, distributed generation, peak demand growth, energy efficiency, energy storage, market seam issues and carbon scenarios. *By checking this box, you consent to ABB Grid Automation using your personal data for the purposes described in the ABB Grid Automation privacy notice. You may revoke your consent at any time by completing the form at abb.com/privacy.